Discoveries abound, by bicycle, on foot, and by kayak, on an active vacation that also allows you to slow down to the easy pace of Southern living. Discoveries abound, by bicycle, on foot, and by kayak, on an active vacation that also allows you to slow down to the easy pace of Southern living. We’ve charted a course down paths lined with Spanish moss-draped trees, through the waters of a richly diverse estuary, and along the charming shore of the Intracoastal Waterway. During the journey, you’ll see the fort where Edgar Allan Poe once served, delve into the historic culture of freed slaves, and spend time pursuing your own pleasures in two of the most welcoming cities in the South. This tour offers options for easy rides throughout the trip. Our VBT van support shuttle is always available for those who would like assistance. This vacation is ideal for beginning and casual cyclists. Travel to Charleston and gather at the Ansonborough Inn, the first hotel on your Southern Reel itinerary. If you’re flying in, you can arrange to meet VBT’s complimentary shuttle after your arrival at Charleston International Airport. The shuttle leaves the airport at 2:00 p.m. Please call Mount Pleasant Shuttle at 843-971-4901 or toll-free 866-223-7226 to make a reservation, clearly stating you are a VBT guest. Reservations must be made at least 24 hours in advance of travel. Mount Pleasant must have your names and the airline and flight number you will be arriving on. If you are arriving after this shuttle departs or your flight is delayed, you must make your own arrangements to reach the inn. For guests who are driving to the tour, parking will be available at the Ansonborough Inn for the week at a charge of $15 plus tax per day. Parking is also available at the Charleston airport for $8 per day. Please contact the Ansonborough Inn to advise of any travel delays or changes; they will pass your message along to your VBT Trip Leaders. Meet your VBT Leaders at 3:00 p.m. for a safety briefing and bike-fitting session, followed by a warm-up ride. You’ll wind your way through historic “South of Broad,” taking in wide views of the harbor and Fort Sumter, then continue riding through the historic market. We will also pass St. Philip’s Church, one of Charleston’s oldest, located on appropriately named Church Street. Tonight, get to know your fellow travelers during a welcome reception at the inn, followed by dinner at a local restaurant. After breakfast, you’ll cycle along a dedicated bike/pedestrian lane on the dramatic Arthur Ravenel Bridge over the Cooper River. Ride through Sullivan’s Island and over another bridge to the Isle of Palms, passing by some of the area’s most sought-after homes and traveling along the Intracoastal Waterway, where you’ll be treated to views of the beach and access ways. 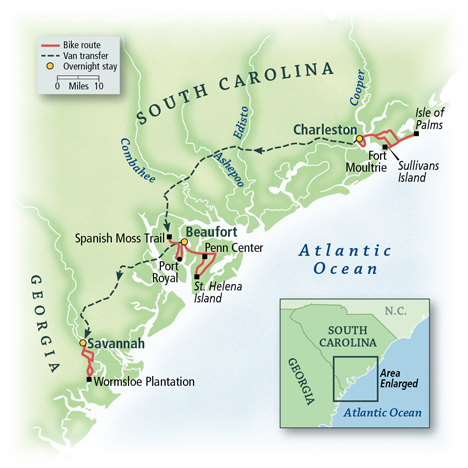 After lunch at a local restaurant on the Isle of Palms, continue cycling to Fort Moultrie. Edgar Allan Poe was stationed here from 1827 to 1828, while serving in the U.S. Army. The fortress played a key role in both the Revolutionary and Civil Wars. After your visit, you’ll return to the Ansonborough Inn, where you’ll have time at leisure to explore Charleston on your own. Perhaps enjoy a stroll along the Battery, the promenade flanking the city’s scenic harbor. Today, you shuttle about 70 minutes south to Beaufort, where you’ll embark the Spanish Moss Trail. Formerly the path of the Port Royal Railroad, this 12-foot wide, paved, multi-purpose trail offers beautiful water and marsh views, coastal wildlife viewing, and historic points of interest, and it meanders through Spanish moss-draped neighborhoods. Arriving in Port Royal, a quaint lowcountry town in the heart of a biologically rich estuarine ecosystem. Continue riding to Beaufort where you’ll enjoy a picnic lunch prepared by your Trip Leaders. Then, embark on a guided kayaking excursion through a habitat that offers a perfect nesting habitat for more than 200 species of birds. You’ll discover the secrets of nearby salt marshes and learn about the lowcountry and what makes it so special. Your final destination today is Beaufort. 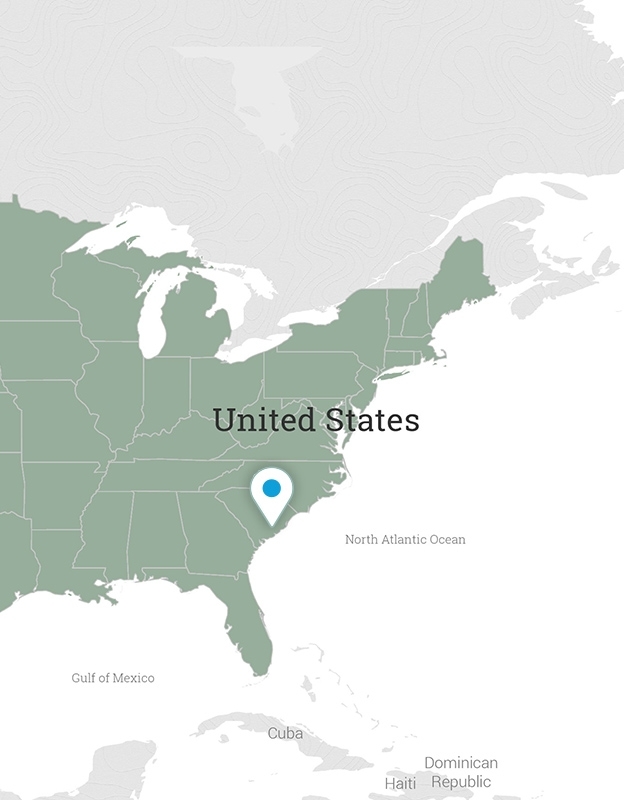 Named “the South’s Best Small Town” by Southern Living in 2017, it is a charming town renowned for its sea islands, historic downtown and savory Lowcountry food. Check into your hotel here and make yourself at home. The Beaufort Inn is conveniently located to give you easy access to the city’s waterfront and beyond. Enjoy a lowcountry boil before partaking in a famous Southern tradition: a Beaufort social, at your inn. You’ll have the opportunity to dance the exuberant yet dignified Virginia Reel, a Colonial folk dance. If you wish to enjoy the Beaufort Inn’s spa services during your stay, VBT encourages you to make your reservations well in advance of your arrival. After breakfast in town, ride through beautiful farmland to St. Helena Island, passing the historic Chapel of Ease along your way. During the Colonial period, rice and cotton planters who found themselves too far away from the churches of Beaufort constructed informal houses of worship—they came to be known as “chapels of ease”—on their plantations. Built in the mid-18th century, St. Helena’s Chapel of Ease was largely destroyed by a fire more than 100 years later. Its four original walls remain, making it an evocative historic landmark. After your ride, enjoy a visit to the Penn Center, a National Monument and the first to recognize the Reconstruction Era of the South. Founded in 1862 to educate freed slaves, it’s now a cultural center featuring the history of the African-American residents of the Sea Islands, a community also known as Gullahs. Dr. Martin Luther King Jr. held the annual retreat for his Southern Christian Leadership Conference at the center. After your visit, you’ll enjoy a picnic lunch prepared by your Trip Leaders, then return to Beaufort via shuttle or on your bikes. Later, embark on a walking tour of Beaufort. You’ll stroll through the city’s mix of antebellum mansions, live oaks, and charming 1950s storefronts with a resident guide, who will explain why the town has lured so many moviemakers to its lovely streets. A number of critically acclaimed films have used Beaufort as their backdrops, including Forrest Gump with Tom Hanks, The Prince of Tides with Barbra Streisand, and The Great Santini with Robert Duvall. Make your own dinner plans in Beaufort this evening; there are many excellent restaurants from which to choose. This morning, shuttle to Savannah (approximately 90 minutes) and spend time exploring some of the most memorable sites of this city. You’ll embark on a walking tour of Savannah’s picturesque streets and squares, gaining an understanding of the city’s history, architecture, gardens and abundant charm. Did you know that Savannah has the oldest standing antebellum railroad complex in America? Or that Savannah had the first practical cotton gin? Your guide will help you envision Savannah as a colony, through the Victorian Era and on to the present day. After you settle in at your hotel, the remainder of the afternoon is yours to explore Savannah at leisure. Lunch and dinner are on your own today. After breakfast, you ride out from the center of Savannah toward the Isle of Hope. Featuring a number of attractive old homes dating from the first part of the 19th century, the Isle of Hope looks out over the Intracoastal Waterway. Our destination is informally known as Wormsloe Plantation, a State Historic Site. One of the most photographed locations in the entire South, it features a 1.5-mile-long live oak avenue framed by a graceful stone entry arch. The remains of the estate—which was constructed using “tabby,” a building material similar to cement and made from lime, ash and crushed oyster shells—constitute the oldest standing structure in Savannah. After some free time for lunch on your own in the Isle of Hope area, you’ll continue your ride. Your route goes past Savannah State University’s Thunderbolt campus and the moss-hung gardens of Bonaventure Cemetery, an 18th-century cemetery featured in John Berendt’s critically acclaimed novel Midnight in the Garden of Good and Evil. You’ll have free time to explore Savannah when you return. Tonight, celebrate with the group during a farewell dinner at the hotel. Your tour concludes after breakfast this morning. A complimentary VBT shuttle is available to take departing guests back to the Charleston airport (CHS), arriving around 11:30 a.m. For this reason, we suggest a flight departing no earlier than 2:00 p.m. Guests with cars parked at the Ansonborough Inn should plan to take a taxi from the Charleston airport to the inn. The cost is about $30. If you wish to avoid the transfer back to Charleston, you may choose instead to fly out of Savannah. We do not offer shuttle service to the Savannah airport. A taxi to Savannah International Airport costs about $25. The Ansonborough Inn is located within Charlestons historic district of Ansonborough, so named when Admiral George Anson won the property in a spirited poker game. Just one block north of the Market Street area, it is centrally located and close to all of historic downtown Charleston. Once a shipping warehouse, the property was transformed into a luxury hotel after a $3.5 million renovation. With only 46 rooms, the hotel makes guests feel very much at home. Rooms range in size from 450 to 750 square feet and feature individual climate control, voice mail, mini-fridge, microwave, and in-room safe. Enjoy the hotels expanded continental breakfast and daily wine-and-cheese reception. The rooftop deck and cozy pub offer relaxing spots for a drink. Sophisticated and modern, the Andaz Savannah is a stylish haven on the edge of the historic district. This artfully decorated hotel is just a few blocks from River Street, the bustling shopping avenue along the Savannah River, and set right on Ellis Square, a lively urban square of fountains and a life-sized chess set. Relax on the outdoor pool terrace and enjoy a handcrafted cocktail before settling in to your room graced with fine linens, comfortable robes, and a walk-in shower. With a majestic main house and several adjacent cottages, the award-winning Beaufort Inn occupies an entire block in the city of Beauforts historic district. A splendid example of Victorian architecture, the complex dates to the 1890s and features elegant gables, wraparound porches lined with inviting rocking chairs, and a lush, manicured garden. During your stay, you may wish to relax with a massage at the inns on-site spa, or enjoy afternoon tea in one of its mahogany-paneled dining rooms. Each of the Beaufort Inns 28 rooms is air-conditioned and equipped with cable/satellite television and complimentary wireless Internet access. 7 Days. Includes bike vacation only.